Ixworth Free School: Where does the advert end and editorial start? In a democracy the press play a crucial role as one of the main checks and balances to hold the government to account. A free press is rightly seen as one of the hallmarks of a free country. This is just as true of the regional press which ought to be holding local government institutions such as councils and schools to account. The opening of several free schools in Suffolk has been highly controversial over the last few years. Like many areas the regional press in Suffolk has seen declining circulations and reduced staff. Clearly such publications depend on advertising money to survive. 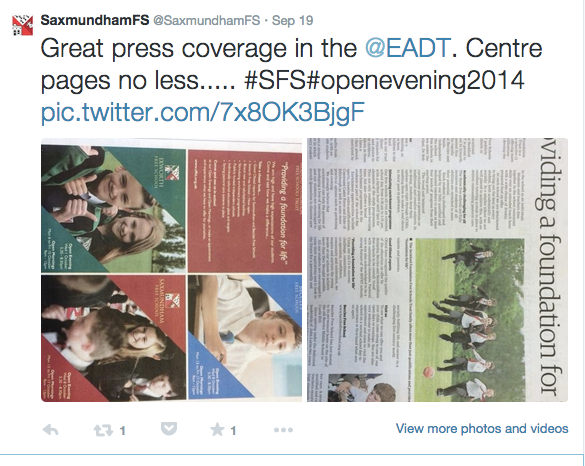 Recently we have seen the Seckford Free Schools Trust run by the Woodbridge-based Seckford foundation go on an advertising spree splashing out for online and print adverts in the EADT and EDP titles run by Archant. Seckford probably see nothing unusual in spending money on advertising as they run the privately funded Woodbridge School and have advertised that for some years. However advertising schools maintained at public expense raises at least two significant questions. Firstly is this a good use of public money? The adverts for these schools are being paid for by public money that many might wish to see spent on educating children rather than on advertising. Secondly when you look at the picture above you can see an article entitled Ixworth: Parent defends new free school in west Suffolk with an advert paid for by the school immediately above it! Where does the advert end and the editorial content begin? In this case the headline of the "article" is the Trusts own slogan "providing a foundation for life" and the article is right next to a page of paid for advertising in colour. My real question for the EADT is this. Would they now be prepared to run genuinely critical coverage of Seckford if they felt there was a story or would they have one eye on their much needed advertising revenue?